It doesn’t occur to me often when I watch films from two different geographies and they weirdly connect over a common crux. 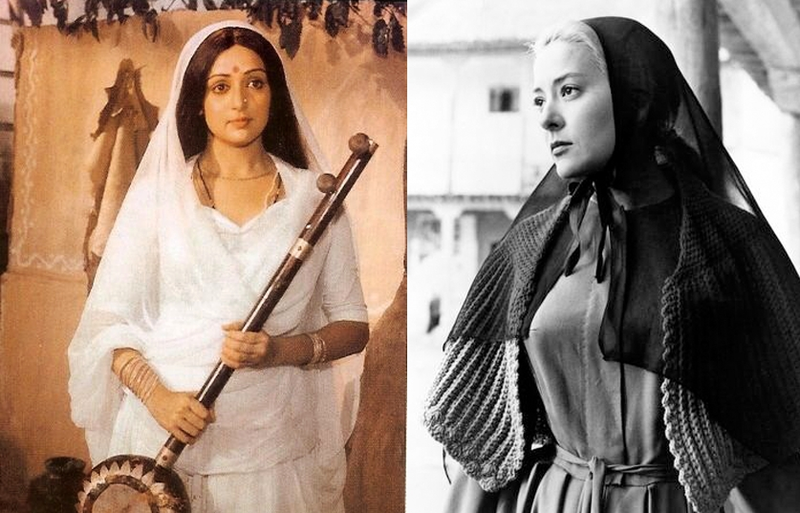 The unusual happened as I explored Luis Buñuel’s iconic Spanish classic Viridiana (1961) and Gulzar’s Hindi feature film Meera (1979). The former is about a novice nun’s tryst with the disruptive ways of the world. The latter is based on the life of the eponymous Hindu saint. Without exaggeration, the similarity between both is with respect to their respective protagonists. Viridiana and Meera are devout to the extent that it affects the decorum of their surroundings. Both films examine righteousness – ethical and moral – through these women as they practice ideas that are poles apart but are connected by a similar chord of faith. Meera is the daughter of King Biramdev of Medta province in Western India. In the times of the famous Mughal rule, the Hindu states of Rajasthan struggled to form a stealthy unit. In one such reconciliation attempt, Medta proposes an alliance with the neighbouring Sesodia Kingdom. The alliance is that of a marriage – between Meera (Hema Malini) and Rana Bhoj Raj (Vinod Khanna). We are also shown that at an early age a naïve Meera emotionally weds Lord Krishna. So much so that she develops jealousy towards his love interest, Goddess Radha. 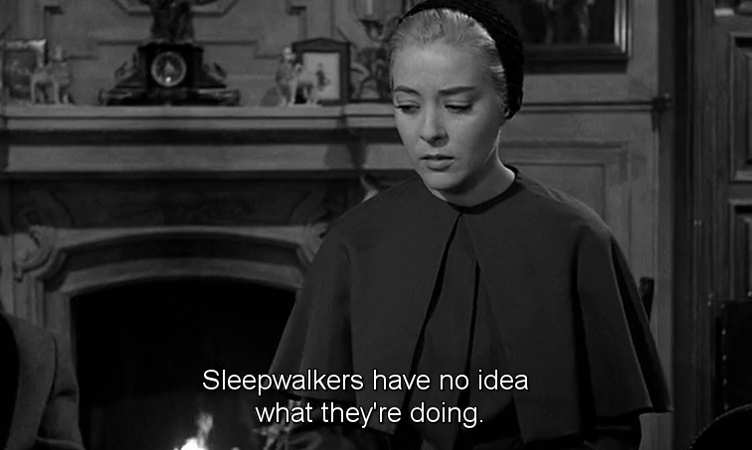 Buñuel’s Viridiana is a soon-to-be nun, almost otherworldly in her ways. Viridiana (Silvia Pinal) is so austere at being the mystically betrothed bride of Christ that she places a large cross and a crown of thorns on her bedside. An angelic beauty, she happens to visit her benefactor – her estranged uncle – upon being ordered by the convent’s Mother Superior. The visit changes her life around as her uncle (Fernando Rey) begins to develop incestuous feelings. Viridiana, being the godly woman that she is, resists his advances with great contempt only to be told (a lie) that she was drugged and deflowered. Appalled, she leaves for the convent and before she could board her bus, she receives the news of her uncle’s suicide. Her guardians from the convent pay her a visit of condolence. Viridiana expresses contradictory sentiments of being innocent and also bore the guilt for her uncle’s untimely demise. Taken aback, the Mother Superior demands a confession that is eventually refused. 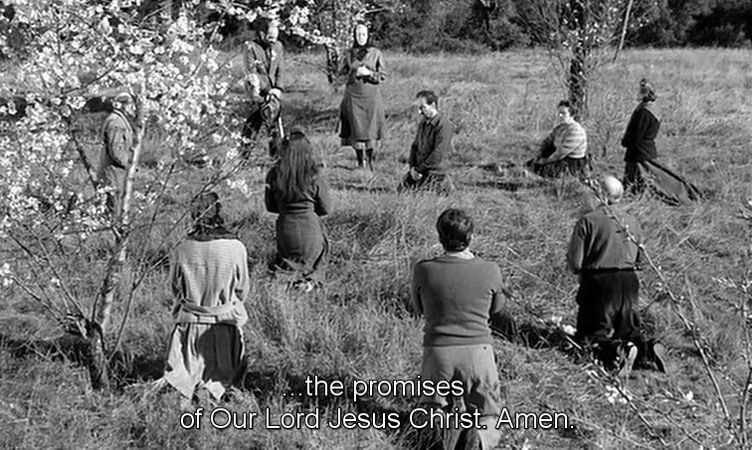 Viridiana declares that she ought to be obedient to the limits of a routine Catholic as she no longer intends to embrace nun-hood. Soon we learn that the deceased man had named Viridiana and his illegitimate son Jorge as his heirs. Meera’s strong contention on Krishna being her husband is what binds her story together. She writes devotional songs (bhajans) and forges an imaginary relationship, the romantic connotations of which are far from subtle. Meera confesses how she will remain faithful to the ‘deal’ that binds two provinces but wouldn’t perform wifely duties as she had already wed Lord Krishna by the soul. Her husband laughs it off initially, only to get a hint of her willpower later. For Viridiana, her devotion to Jesus Christ doesn’t end with her decision to give up nunhood. In absolute lack of knowledge on how to manage her inherited wealth, she pursues what the religion teaches her – to be charitable. This could also be been seen as a subconscious move to wash off emotions of remorse that lay deep beneath. 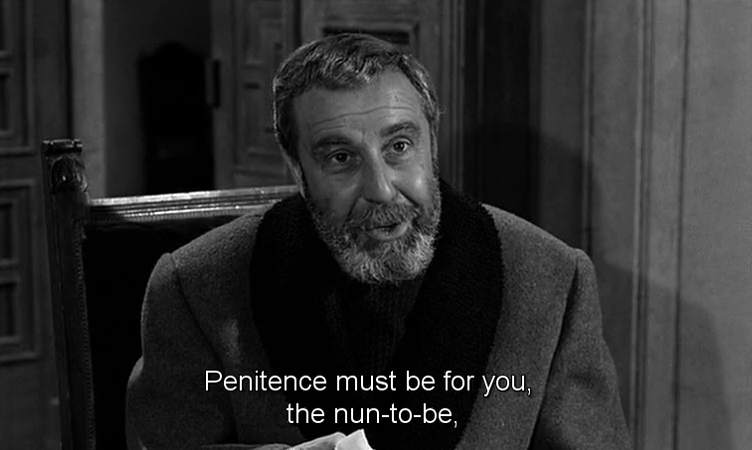 Viridiana becomes the benefactor to a group of paupers she meets at the local church premises. Unknowing of ways of the real world, Viridiana treats them with love and respect – almost becoming a Florence Nightingale with a religious cause. Meera is easily the stronger out of the two, for the fact that the film largely projects the message that godliness gives you immense willpower. Meera is a one-woman army as she tackles hostility from all corners. It is only her husband who displays an iota of sympathy, for reasons that are unsaid. Meera is also seen to take the holy fast of karwa chauth which she breaks only after getting a view (darshan) of her beloved God’s deity. In contrast, Viridiana is a resilient picture of suffering. Servant Ramona notices how she wears rough linen gowns to bed – a fabric that will do no good to her porcelain skin. Throughout the film, Viridiana is shown to display unimaginable restraint and patience to oppression and injustice. 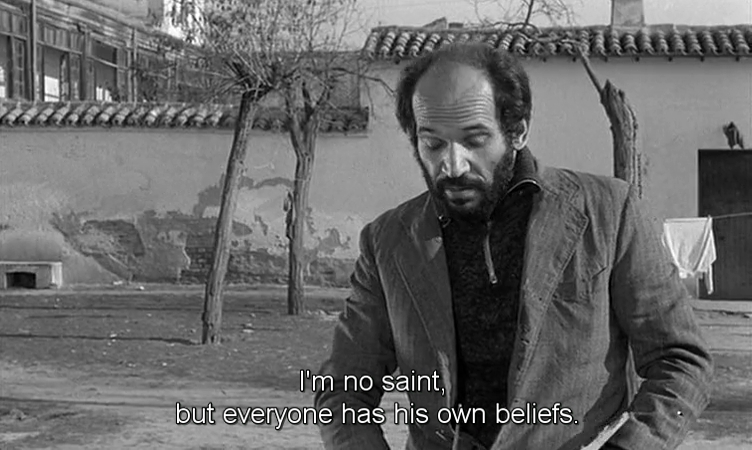 Like how Buñuel clearly believed, his protagonist was easily the most ill-informed and ill-equipped person in the story that revolved solely around her. Her civic sense and belief systems are so strong that she never questions the possible anomalies of her idea of social service. Viridiana remains a sufferer till the final climactic jolt. Viridiana lives in a congregation and is a clear favourite of the Mother Superior. It is the Mother who commands Viridiana to visit her uncle once before she takes the holy vows. Later, in perhaps her only independent decision, she takes a stance and refuses to return to the convent. For the rest of the film, she remains submissive and largely unaware of the ways of the world. Even with her rational cousin looking after her and their inherited property, Viridiana withdraws herself to a shell of idealist service that is clearly blinded by vigorous beliefs. Meera, on her part, is far more equal to her male counterparts in the film. Although not aware or sensitive to the administrative challenges faced by her province, she (and certain women in her family) are not shown to bog down to the ways of men. Meera’s stubborn, irrepressible ways baffle many. Viridiana is not shown to have any honest advocates. There’s the family servant, Ramona, who treats her with reverence. Ramona never interferes, questions or opines on Viridiana’s faith or related activities. Ditto for her long-lost cousin, Jorge, who keeps himself within his graceful limits of decency although it is indeed hinted that he is a promiscuous man. For the rest, most of the characters she instils faith in betrays Viridiana in one way or the other. Happy in her trance-like world of Krishna bhajans, Meera is unconcerned about anything humanly – hunger, fatigue, safety. She does get a little sympathy from her husband and Meera’s conscience is guilty of not being able to serve him the way he deserves to. Meera places Godliness on a high moral citadel. It asserts how devoting one’s life to the almighty while compromising on spousal duties is acceptable in the larger scheme of things. We do understand the political reasons that force Meera to accept the nuptial agreement with Bhojraj. However, her remorse towards her humble, loving and patient husband is more or less half-baked. 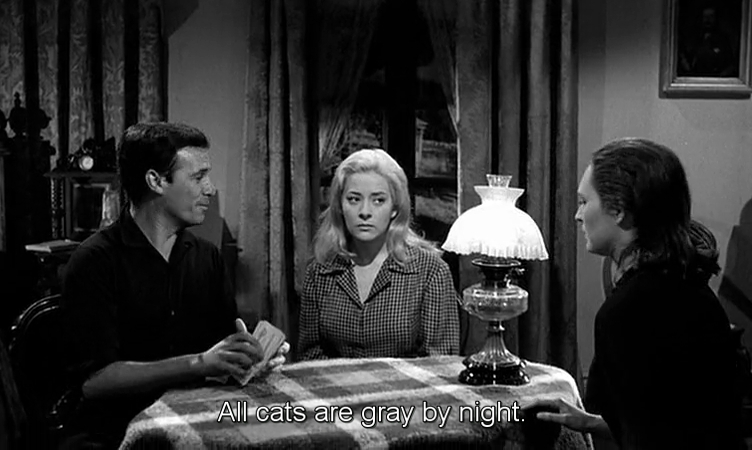 Viridiana, on the other hand, makes an irreverent statement about the ways of the Catholic Church. A satire, the film challenges several of the seven deadly sins in the most unsubtle manner. 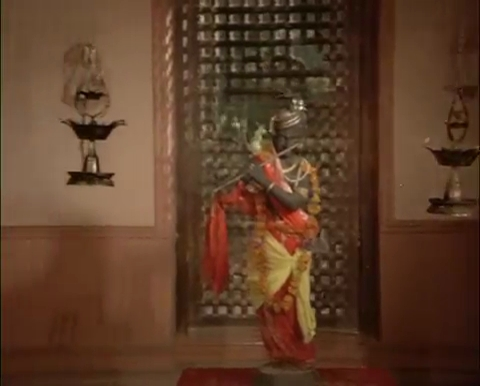 Through the course of the film, the pious protagonist is projected through a prism of supreme ignorance. There’s a short segment in Meera where the famous Mughal emperor Akbar and his court singer Tansen pay a visit to relish her magical vocals. Given the political texture that underlines the conflicts in the narrative, this meeting asserts Meera’s humane, intuitive nature. Disturbing and heartbreaking, the final sequence of Viridiana involves her adopted group of beggars indulging in heartless debauchery. 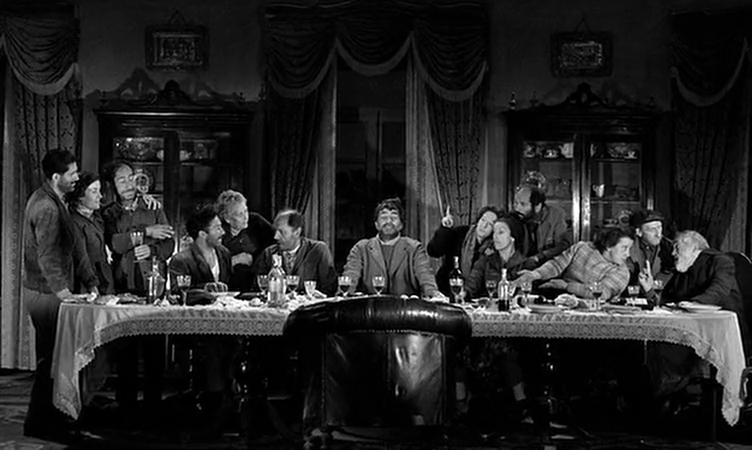 One stark, controversial moment is where the group recreates a scene that resembles ‘The Last Supper’ for an imaginary photograph. Made in India in the late ’70s, Meera met with acceptance (although it was a commercial failure). The straight-cut message on faith and a religious figure was revered upon release. Having said that, Meera remains one of the better Indian made films based on the idea of devotion with a rather convincing lead performance by Hema Malini. Music composed by Pandit Ravi Shankar and crooned by Vani Jairam are considered iconic. Marking Luis Buñuel’s return to Spanish filmdom, Viridiana sparked massive controversy and faced denouncement by the Vatican. Spanish censors forced the makers to alter the ending and all prints of the film were destroyed except one, that the leading lady Silvia Pinal fled to Mexico with. Viridiana won the coveted Palme d’Or at Cannes Film Festival and is considered one of the finest feature films ever made. Previous Post“Sachin: A Billion Dreams” deserves laurels for its format! “Cold War”… An exquisite musical romance set in times of spiralling political tension! 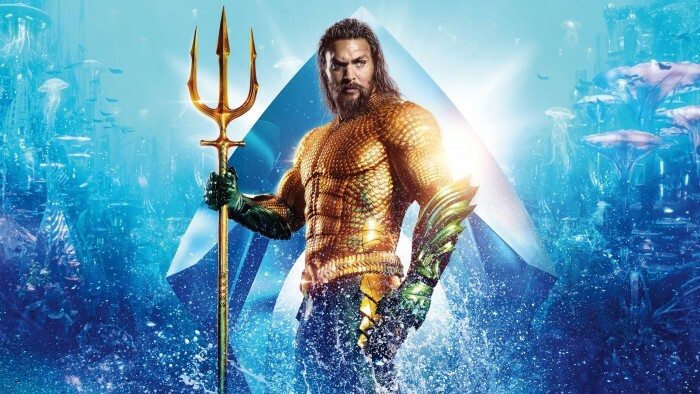 “Aquaman” makes serious waves with visuals but is distinctly over-the-top!